TEMPE – A write-in candidate has never been elected governor of Arizona, and the odds are long that one ever will be. But don’t tell J. Johnson that. Posters bearing his smiling face are popping up at street corners in the Valley, and while greeting people at a coffee shop here recently Johnson said he’s serious about challenging Republican Doug Ducey and Democrat Fred DuVal even though he lacks their campaign teams and money. “I’m 100 percent sure I’ll win,” he said. 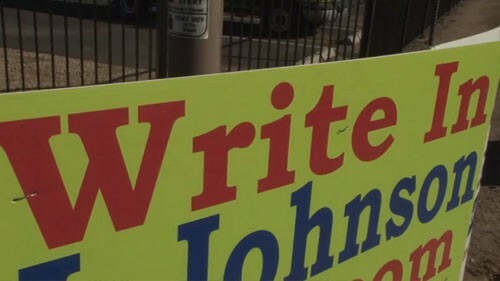 One of five people listed by the Arizona Secretary of State’s Office as write-in candidates for governor, Joseph James Johnson, known to his friends and supporters simply as “J,” has spent nearly $3,000 that he loaned his campaign, according to his most recent campaign filing. He’s also the only write-in candidate with a campaign website. Johnson said his political beliefs don’t belong to any party. While he leans conservative on many issues, focusing his campaign around “Faith, Family, Friends, Farming and Firearms,” he said that he sets himself apart from traditional conservatives through his interactions with people. The 48-year-old Johnson, younger brother of current Phoenix Suns announcer Eddie Johnson, was born in Chicago and came to Arizona State University to pursue a basketball career, though he said an injury cut that short. Since then, the Casa Grande resident said he has been a television actor, a stand-up comic and a marketing specialist for Kraft Foods. Though he doesn’t have is any political experience, he called that an advantage. A place on the general election ballot would require him to gather more than 30,000 signatures from registered voters – 3 percent of the total number of registered independents in Arizona. The only requirement to become a write-in candidate was filing with the Secretary of State’s Office to ensure that he meets the age and residency requirements. Matt Roberts, director of communications for the Secretary of State’s Office, confirmed that Johnson met the requirements. Stephen Nuño, associate professor of politics and international affairs at Northern Arizona University, said that if a write-in candidate were to make a splash this year it would likely be because voters are fed up with politics as usual. But he noted that Johnson and other write-in candidates are up against a lot, starting with a lack of name recognition and money. Geoff Vetter, DuVal’s press secretary, said the campaign doesn’t view Johnson’s candidacy as a threat. “I don’t think a write-in candidate will have much impact on the race for governor,” Vetter said. Torunn Sinclair, deputy communications director for Ducey’s campaign, asked a reporter to email questions about Johnson but didn’t respond. He said this route has freed him to go straight to the people with road signs and a grass-roots campaign. 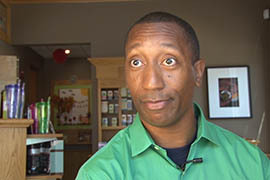 “My street polls bring back a 95 percent approval rate with the common person walking up and down the street,” he said. 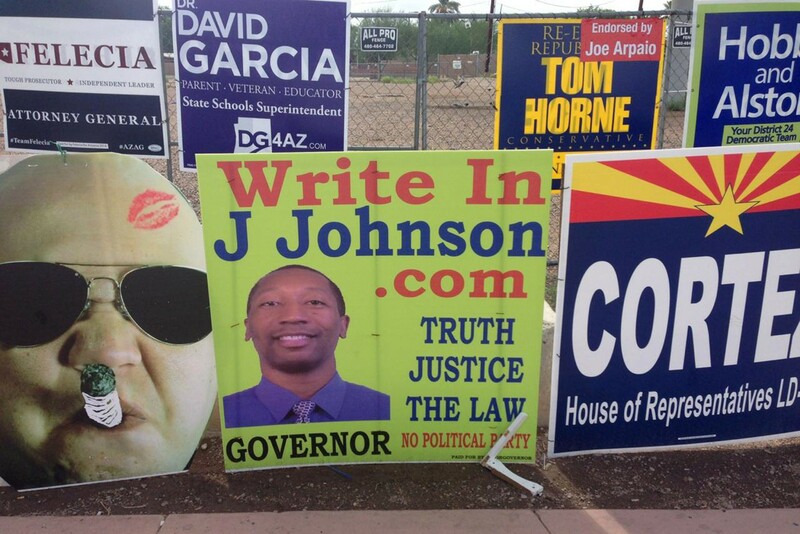 Write-in candidate J. Johnson thinks he has the best chance of becoming Arizona's next governor. Cronkite News reporter Megan Guthrie has a look at his campaign. J. Johnson, one of several write-in candidates for governor, said he's running because his wife told him to stop griping about politics and do something about it. 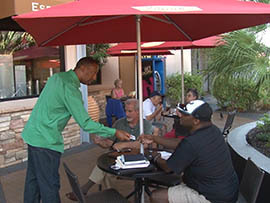 J. Johnson greets customers at a Tempe coffee shop. He's running for governor as a write-in candidate. 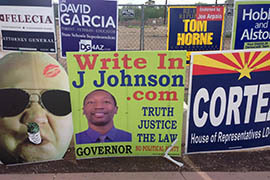 Amid campaign signs for mainstream candidates, write-in candidate J. Johnson touts himself for Arizona governor.